In today’s day and age, technology is a part of everyday life. Checking text messages, emails and social media accounts is something that most of us do on a fairly regular basis. There are various snazzy devices out there that can help you do this while you’re out and about including smartphones, tablets, and laptops. The problem is that all of these devices have limited battery power. And there’s nothing worse than seeing dreaded battery bar flashes empty and powers down the very device that keeps you connected to the modern world. Thankfully, that’s where solar battery chargers in. A solar battery charger is the answer to all your power needs while you’re out in the middle of nowhere and need to add some juice to your smartphone, laptop, tablet, or other electrical device. No longer do you have to go without power or search around for hours on end looking for an available electrical socket to use. With a solar battery charger, you simply use the sun’s energy in which to power your device. For a more in-depth guide on how solar battery chargers work click here. Who could benefit from a solar battery charger? Just about anyone, that’s who! Most of us today feel completely lost without our creature comforts, and this includes our phones. 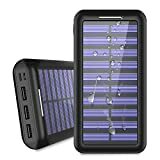 So to ensure they remain working wherever you are in the world, a portable solar charger is needed. Some of the more obvious situations where these devices are useful include while hiking or camping. But rescue teams could also greatly benefit from using solar battery chargers as they carry a lot of vital electrical equipment around with them. As could anyone who enjoys spending time in the great outdoors. There are many different solar battery chargers available to buy right now that you are literally spoilt for choice. However, unless you know a little about solar battery chargers choosing the right one to suit your needs can be an absolute nightmare. The following section will take through some of the things to look out for when shopping for a solar battery charger. This should help you a lot when going to make your purchase. Materials - This is one of the most important aspects to consider when purchasing a solar battery charger. Because your solar battery charger is always going to be on the move with you, and out in the sun, you need to ensure the model you choose is fit for its purpose. It should lightweight but durable. And unless you’re a great weather forecaster and know that you’ll never experience any rain, you may want to consider a waterproof or at least water-resistant model too. Charging time - The time it takes for your device to charge will vary depending on a number of different factors, the most important being the amperage output that device is capable of. A fully charged battery that has a rating of 1 or 2 amps should be more than enough to charge a smartphone fairly quickly. The other factor to bear in mind is the Milliamp-hours (mAhs) of whatever it is you’re charging. The bigger the capacity, the longer it will take to fully charge. Wattage - The size of the battery you need will depend on what it is you need to charge while on the move. If all you have to worry about is a keeping a fairly simple smartphone charged, then a 4-5 watt battery charger will be fine. But if you have a power hungry iPhone you’ll need a 7-watt charger and for iPads, you’ll need around 15 watts. One thing to bear in mind is that chargers with a low wattage will charge much slower than those with a higher wattage. As a rough guide, it will take around 3-4 hours to charge a smartphone with a 4-6 watt charger and around 1-2 hours if using one with a higher wattage. Check your connections: Most standard solar battery chargers are fitted with USB port (s). The problem with that is not all devices are charged in this way. Many photo cameras, for example, use special adapters in which to charge. So before making your purchase be sure to have a think about what it is you need to charge and whether you’ll need any special adapters in which to do it. Size and weight: These are quite important features to consider when you’re on the move as every inch and every pound you’re carrying with you. If you’re not going to be transporting it very far then it doesn’t matter too much. But if you can find a model that’s compact or foldable it will save you space and weight if you ever do need to take it further afield. As a general rule of thumb the more USB ports the device has, the larger it will be. Easy to use: When you’re on the move and your phone’s battery is just about to use its last ounce of energy, the last thing you want to be doing is to be scrabbling around with an overly complicated device trying to get some power. There are many different models out there when it comes to solar battery chargers and while most of them are relatively easy to use some are more trouble than they’re worth. So just take your time and do a little research before you do make your purchase to avoid landing yourself in the above situation. Price: A lot of people feel that for what they are, solar battery chargers are expensive. However, when you consider what they do and just how well they do it, I beg to differ. These devices can get you out of a sticky situation when you need it most and are perfect to take to festivals, camping, long road trips, or anywhere else you may be without power for a while. The main reason as to why they differ in price is normally down to the different features they have. But just remember when paying for your next solar battery charger is that it is an investment rather than just another pointless purchase. Extra features: Obviously extra features aren’t necessities, but they can help to sway your decision one way or the other. Sometimes the extra feature may be nothing more than an additional USB port. Other times you may see an integrated flashlight or even panic alarm. But just remember that more often than not, you will be paying more for these extra features. So if you are on a budget or don’t really need them, you’re better off saving your money and sticking with a more basic model. 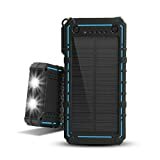 To help you come to an informed decision about your next solar battery charger purchase the following are a few short reviews on some of the most popular models out at the moment. 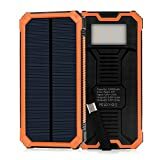 Available in black, orange, or red, this compact solar battery charger on offer from ALLSOLAR will keep your phone going just when you need it most. It’s fitted with lightning, micro USB, and USB ports and has MultiProtect technology which uses surge protection to make sure you and your devices remain safe. And, there’s an integrated LED light indicator that lets you know just how much your phone is charged. Thanks to the hefty 2400 mAh capacity, you can get up to 10 iPhone 6s charges or around 7 Galaxy S6 charges each time. If you’re looking for an all-around good solar battery charger that won’t cost a fortune, this may be the model for you. Available in 3 different color options and with a 13500mAh capacity, not only does this WBPINE solar battery charger look great but it performs really well too. While the faster charging does hinder the number of times you can charge a device, it’s definitely worth the sacrifice if you’re not travelling for long. It has a waterproof, shockproof, and dustproof shell and is even equipped with a metal hook to assist with mounting. And there’s even an integrated LED flashlight! With a capacity of 2500mAh and not one, not two, but three USB ports, this solar battery charger on offer from CXLiY will give most other models out there a run for their money. There are also two inputs to allow for charging via an iPhone or an Android port. 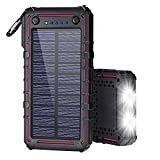 Other features include an LED flashlight, a handy hook for easy mounting, and a water-proof solar panel that’s capable of absorbing light from pretty much anywhere. Compatible with iPhones, Samsung Galaxy’s, and many others, this is one cool solar battery charger. 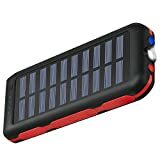 Stay connected for up to a week while on the move with this funky little solar battery charger on offer from Ayyie. Available in an all black design or a red and black design, this charger is one mean looking device. It’s equipped with three USB outputs, giving you the flexibility of charging up to three devices simultaneously, and is compatible with iPhone, Samsung, and a number of other phone manufacturers. Weighing in at 12 ounces it’s not the lightest model out there, but it’s light enough. The best feature about this charger (in our opinion) is its ruggedness. Made from ABS plastic, this charger is both waterproof and durable and likely to withstand even the harshest of weather, making it perfect for use outdoors. If you’re looking for a fast-charging solar battery charger that’s both well-built and easy to use, then be sure to check out the ELZLE Solar Charger. With a capacity of 15000mAH, you can charge an iPhone 5S more than 4 times, an iPhone 7 three times, or a Galaxy S6 twice. There are two output ports to enable simultaneous charging, 4 LED indicators to let you know how fully charged your device is, and a funky flashlight to help you out when in the dark. Although the case feels pretty durable, it’s not waterproof and is certainly nothing special to look at either. And while it does offer fast-charging, it seems that this is only some of the time. We hope you found the above product information and review useful and are now one step closer to making your next solar battery charger purchase. For us, the clear winner at the moment when it comes to these helpful little devices is the ALLSOLAR Portable Charger. It’s fast charging, equipped with a multitude of input and output ports, and it has a very healthy power reserve. And even though looks aren’t extremely important when it comes to solar battery chargers, this model is one of the more attractive ones out there too. It may be one of the more expensive solar battery chargers out there, but for anyone wanting high-performance and reliability, it’s definitely an option worth considering. Solar power has come a long way over the past few years and is now the prefered source of energy for millions of people across the world. It’s much more eco-friendly than fossil fuels, quite easy to switch to, and best of all, it’s free! The problem is that unless you know exactly what you’re looking for buying a solar power generator can be tricky. But, thankfully, that’s where we come in. The following article will take you through some of the more important things to look for when looking for a solar power generator to help you make the right choice. There are many different solar power generators available to buy on the market right now. And while they do all strive to get the same result, some offer better features and some are simply much more efficient. It can sometimes be hard to find the right balance between price and performance when it comes to solar generators as they vary so much. While some features don’t really seem necessary others are key to doing a good job. Use. What do you intend on using the solar power generator for? Are you more interested in having a backup supply for your home in the event of a power outage or just a secondary power source? Or are you looking for a more portable solution for generating electricity as you’re on the move? This is the first thing you need to consider when preparing to buy your solar generator as the answer to this will determine what type of solar power generator you should buy. Solar backup generators: These are more permanent renewable energy solutions that provide electricity for homes in the event of a backup. They’re usually very high in terms of wattage capacity and will normally use multiple batteries to increase power storage. 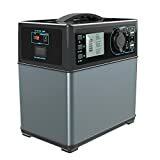 While solar backup generators are good for powering the essentials within the home such as lights, TVs, and computers, it’s unlikely you’ll find one that will power everything. So just bear this in mind when making your purchase. Portable solar generators: If you’re looking for renewable energy while on the move then it’s a portable solar generator that you require. Compact and efficient, these machines are great for use when camping, picnicking, and other outdoor events. While these generators have a much lower wattage than solar backup generators, they’ve still got enough to power up and recharge various small electricals including smartphones, tablets, lights, and more. Battery storage capacity. This largely ties in with what you’ll be using the generator to power. Battery storage is what allows you to use your generator during times of limited sun like at night or during bad weather. It’s also there to store any excess energy that you’ve managed to harness during the day. Of course, the higher the battery’s capacity, the longer you can run the generator in between charges. The amount of time this equates to will depend on the actual wattage each of your devices is demanding, but generally speaking, the higher, the better. Beware of solar generators that have very little or no battery storage capacity as reliability and ease of use will be severely affected. Solar PV input. This refers to the actual solar panels that are used to power the solar generator. To stand any chance of having continuous power throughout the day you’ll need to have adequate solar PV input. Some generators will have solar panels already built in, while others you will need to buy separately and attach. Just be aware that if not already connected you may need to purchase additional components in which to do so. The other thing PV input has a direct impact on is the generator’s recharging time. You can calculate the approximate charging time of any solar power generator by using one simple formula: Take the capacity wattage of the generator and divide it by the total wattage of the solar panels. The answer will be the number of hours charging time. For example, if you had a solar power generator with a capacity wattage of 1000 and your total wattage of solar panels amounted to 200 watts, it would take around 5 hours to charge (1000/5). Any solar power generator with a capacity less than 2500w/h should take no longer than around 6 hours to charge. Anything longer is pretty inefficient and will begin to affect usability. Inverter rating. The role of the inverter is to do what the name suggests and invert (or convert) low volt DC to standard 120 AC power. Without an inverter, the generator would be unable to use any of the energy harnessed from the sun. The way inverters are rated is by the maximum watts it can extract from a solar generator at any one time. For example, a 1000 watt inverter can draw up to that in AC power. As a rough guide, most decent solar power generators will have a usable watt-hours-to-inverter-rating ratio of around 1.5:1 (or 1500 watt-hours: 1000 watt inverter. Portability. If you’re planning to use your solar power generator as a backup energy solution at home, this doesn't really apply to you. If, however, you’re planning on moving around with your generator this is one of the most important aspects to consider. Most of the weight of solar power generators comes from the batteries, which means if you want to make it more portable you will have to sacrifice some of the capacity. However, systems with only one battery already weigh around 100 pounds, so maybe that won’t be too much of a loss. Overall quality. This can be difficult to judge if you’re not physically with the item, but if you do get a chance to view before you buy, be sure to check out the quality of the components used. Solar power generators take a lot of abuse, particularly if being used while on the road. So for that reason alone, you need to ensure you buy a model that’s rugged and not going to fall apart after a couple of recharges. A decent solar controller and inverter should last for at least 2 years. Be aware of any solar power generators with little or no warranty as you will no doubt pay the price when it comes to quality. Why use a solar power generator over a gas powered one? A lot of people are quite happy to stick to their traditional, gas-powered generators simply because that’s what they’re used to and that’s what they know. Unfortunately, these people are losing out. Solar power generators are much more eco-friendly than their gas guzzling cousins. No gas means no carbon monoxide is produced while it’s in use. Plus, unless you’re camping in the middle of Alaska, you don’t have to worry about running low on fuel. As long as the sun is shining, you’ve got power. Another great benefit you get with solar power generators is that they’re essentially noise free, meaning you can use it any time of the day or night without upsetting any of your neighbours. Weighing in at just 12.5 pounds, this 500Wh generator is ideal for taking with you while on the move. From an AC wall outlet, you can charge it in around 6 hours. If using a 102w solar panel it will take around 7, but that’s still not bad. It’s fitted with a 100v AC outlet, two 12v DC 6MM ports, a DC cigarette lighter, and 2 fast-charging USB ports in which to charge all your electricals. And, there’s a clear display screen to let you know how much charge is left in the battery at all times. 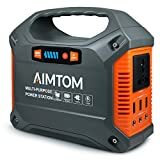 It may be little and weigh just 3.48 pounds, but this solar generator on offer from AIMTOM still packs a heck of a punch. 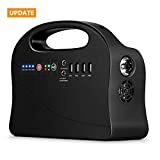 With 3 x USB, 3 x 12v DC, and a 110v AC outlet, this portable solar power generator is the perfect accessory to take camping or any other outdoor event. 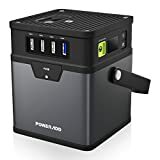 Its 155Wh capacity means it's more than capable of powering your laptops, monitors, cell phones, and other electronics while on the move or in the event of a power outage. And there’s even an SOS emergency LED flashlight to help you in your darkest hour. If you’re less bothered about the size of the solar power generator and more concerned with its storage capacity, be sure to check out this model on offer from PowerOak. At 12.3 pounds, it’s still very portable, and with a capacity of 400Wh, it’s one of the best performing in its price range. It can quite easily power any AC, DC, or USB device that’s under 220Wh and is the ideal solution to use when on the move or in a remote location. There’s a clear LCD display to let you know how much charge is remaining and it even has a jump starter alligator clip cable should you car battery fail you at the worst time. It may not be the most powerful of solar power generators, but the TELONGPU Generator Station is still worth a mention for sure. At 200Wh it’s not a bad capacity, and there are still plenty of output ports in which to charge multiple devices. To recharge the generator it takes around 6-7 hours using an AC outlet or around 8 hours using solar panels. As well as a built-in LED flashlight, it also features a neat little compass just in case you do get lost on your travels. And it’s so lightweight and well designed that you won’t even know you’re carrying it. When it comes to portability the Poweradd ChargerCenter has it covered. Weighing in at 2.8 pounds, it’s one of the lightest portable solar power generators around at the moment. It’s equipped with AC, DC, and USB charging ports and has no trouble at all keeping your small appliances charged while out in the great outdoors. Another great thing about it is the quality. For an item that’s pretty low price, it has some high-quality components. But, that’s where the fun ends. The performance of this generator is shocking. Although 185Wh isn’t the lowest capacity out there, it certainly does make a difference. And unless you want to wait a year to charge your things, we recommend you choose a different model. We hope you found the above information and product review useful and are now one step closer to getting the model that meets your needs. 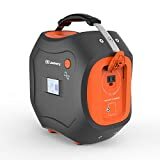 Just as a quick reminder, if you’re looking for an all-around great solar power generator that works well, is easy to move around, and is likely to last a long time, the Jackery Portable Generator is the way to go. It’s versatile enough that it can be used while moving around outdoors or as a backup power supply at home. And while the price may be a little on the high side, it is a solid investment and, in our opinion, one of the best money can buy. A lot of people think that owning an outdoor pool is expensive, but it doesn’t have to be. Sure you may have the initial cost to deal with, but there are many ways to keep the costs down once you have an outdoor pool, and one of those ways is by using a solar pool cover. One of the biggest expenses of owning an outdoor pool is trying to keep it heated using electric heating mechanisms. But with a solar pool cover, you can keep your pool water warmer using nothing but the energy from the sun, meaning no more excessive electricity costs! Once you’ve taken the plunge and bought the pool, it’s simply a case of maintaining it to ensure you get the most for your money. A solar pool cover will help you do that. Not only will a solar pool cover keep unwanted debris from getting in the water, but it will also help to keep it warm too. It’s estimated that a pool with a solar cover water is as much as 10 degrees warmer which reduces the chemical consumption by a staggering 40%. The initial cost is much lower in getting a solar pool cover than an outdoor pool heater. And by using energy that’s harnessed from the sun, there are no ongoing costs either. So, as you can see, heating your pool the natural way is much more cost effective than using an electric pool heater. Now that you know some of the reasons as to why a solar pool cover is such a good investment, we’ll take you through some of the things to take into consideration when making your next purchase. Solar blanket: The solar blanket looks a little like a large sheet of bubble wrap. As well as keeping the blanket afloat, the bubbles act as a magnifying glass heating up your pool. You can get them in pretty much any size, shape, thickness, or color and are one of the most popular options when it comes to solar pool covers. To use a solar blanket for the first time, simply unfold it next to your pool. Then spread it out over the pool water, bubble-side down. If it overhangs at all, simply trim the edges with a pair of scissors. Solar ring: If the very idea of putting on and taking off a big solar blanket seems a chore, then a solar ring may be better for you. They come in all kinds of shapes and sizes with some having wild and funky patterns printed on them. These covers work in a similar way to that of solar blankets but they come in much more manageable sizes. Unlike solar blankets, these must be inflated before you use them. The number of solar rings you’ll need will vary according to the size of both the rings and your pool. Because they won’t cover every inch of the pool, solar rings aren’t quite as efficient as solar blankets. But, they’re still pretty effective nonetheless. Liquid solar cover: This is the newest type of pool cover to hit the market. Rather than have to worry about removing a solar blanket or rings from your pool each time you want to use it, with a liquid solar cover you simply pour the solution into your pool and watch it work its magic. The way it works is by forming a monolayer film that sits on the surface of the water. This film inhibits the water's ability to evaporate in the normal manner. By preventing evaporation, you’re preventing heat loss. Most liquid solar cover formula’s last for around one month. However, one thing to bear in mind with liquid solar covers is that although they’re effective at retaining heat, they’re not very effective at keeping debris out of the water. Size. Both solar blankets and solar rings come in various shapes and sizes. To get the best effect from either you need to ensure you cover as much of the pool’s surface as possible. The advantage you have with solar blankets is that you can literally cut them to the exact size you need to fit your pool. With solar rings, you don’t have that same flexibility. Because they’re inflatable, the size that they are is non-adjustable. And because they’re smaller, individual pieces opposed to one big sheet, there will inevitably be gaps between them when laid out on the surface of the water, making them slightly less efficient. Size isn’t too much of a concern when it comes to using a liquid solar cover. Just be sure you have enough solution for the amount of water in your pool. Warranty: Be wary of any manufacturer that doesn’t offer you some kind of warranty. If a company is not willing to stand by the quality of their product for any length of time, it’s questionable as to how good a product it is in the first place. Most decent solar pool covers come with at least a 2-year warranty. Thickness: The thickness of solar covers range from around 8 mils to around 16 mils. As a general rule of thumb, the thicker the cover the better it is at retaining heat. Another advantage that thicker pool covers have is they’re harder to get blown away. The main disadvantage, however, is that they tend to more expensive than thinner ones and more difficult to roll up. Color: Solar blankets usually come in either a silver, blue, or clear color, whereas solar rings are available in all kinds of colors with all kinds of different designs. And while the manufacturers are trying to cater for people’s tastes, it has a lot more than that. The darker the solar pool cover, the less light that can pass through. So instead, as the sun shines, it creates a very warm layer of water that sits just below the cover and doesn’t go much farther. And because heat rises, most of that warmth simply dissipates into the atmosphere. With a clear solar pool cover, sunlight passes through so much easier. Not only does this mean the water will be warmer, but it will also be heated more evenly. Cost: Any kind of solar pool cover will save you money in the long run, it’s just that some will save you more than others. Solar blankets give your pool the most coverage and are less costly to use solar rings. While liquid solar covers are pretty cheap to use, they’re not nearly as effective as solar blankets or solar rings. With most solar pool covers the price reflects the quality, so please bear this in mind when making your purchase. This well designed solar pool cover on offer from Sun2Solar is a great choice for keeping your pool nice and warm and free from unwanted debris. It minimizes water evaporation up to 95%, meaning less water is lost in the environment and it’s very good at retaining heat. Whether you’re looking for a blue or clear cover, Sun2Solar has it covered. And size is no issue either as you can simply trim it to fit. It’s well made, does a good job, and is good value for money. Lower your pool’s running costs in no time at all with this attractive, blue solar pool cover on offer from Thermo-Tex. 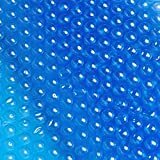 Made from high-quality, UV stabilized polymers, this cover is more than capable of resisting damage from both harsh pool chemicals and the sun’s powerful UV rays. It’s lightweight, easy to cut and easy to use. You can keep it in place while the pool pump is running and it even comes with a 3-year manufacturer’s warranty for that added peace of mind. If you’re looking for a solar pool cover that’s cheap, provides great coverage, and is easy to use then this design on offer from Intex may be just what you need. It does help to warm the temperature of your pool’s water, but it is lacking somewhat in quality. Even though the Intex Solar Cover is made using 160-micron material, it’s very lightweight compared to some of the other covers out there, and its chances of it surviving more than one season are quite slim in our opinion. Stepping away from the usual round bubbles you see in most solar pool covers, this one on offer from Sun2Solar uses a different design approach. It’s clear, diamond design pattern contains more bubbles per square foot than most others around, meaning it will attract more sun and allow more sunlight to pass through. Made from a durable resin material it’s likely to last a few seasons. And the manufacturer’s are that confident in this solar pool cover’s ability that they even offer a whopping 10 year-guarantee! If you’re looking for an above ground solar pool cover that’s durable and likely to last a while, then this model on offer from Blue Wave is ideal to use for warming your water this summer. You can raise the temperature by up to 15 degrees and keep unwanted debris away with this easy-to-use cover and the best part is it’s all free of charge. At just 8-mil it may not be the thickest of solar pool cover’s available, but it still does the job quite well. And considering it’s around half the cost of the Sun2Solar Rectangle cover, it’s not a bad choice really. It even comes with a 3 year pro-rata warranty for that added protection. Hopefully by now you will feel a little more clued up about solar pool covers and have a good idea as to the kind that’s going to suit your needs. Just a brief reminder, if you’re after an all-around good solar pool cover that’s durable, easy to trim, and available in either blue or white then be sure to check out the Sun2Solar 16’ x 32’ Rectangle Solar Cover. This cover is heavy enough to stay put while in use, yet lightweight enough to make it easy to use. You can also trim it to whatever size you need. It may be a little more expensive than some of the other models around, but with this cover, you get what you pay for. It’s fantastic quality and it does exactly what it says it will. What more could you possibly want from a solar pool cover?